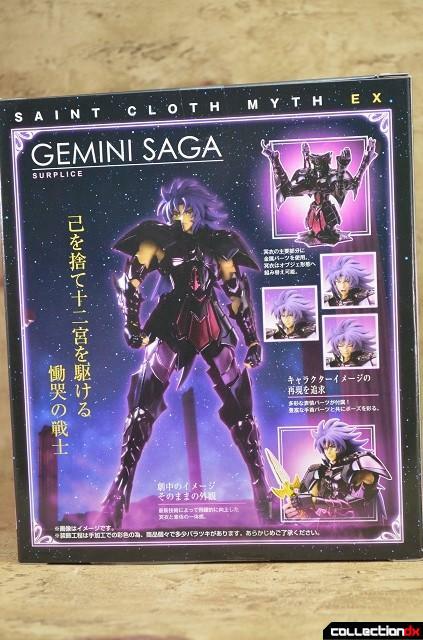 Gemini Saga is a very important character in the Saint Seiya universe. 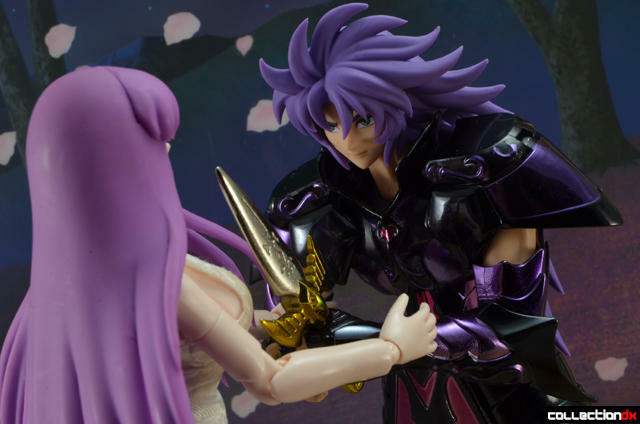 In the Hades arc of Saint Seiya, Gemini Saga returns from the dead in order to fulfill a very bleak mission. Along with Camus and Shura, Saga infiltrates Sanctuary in order to take Athena’s life. Hell-bent of fulfilling his mission, Saga takes down any foe that gets in his way, whether it is a Specter of Hades or a Saint of Athena. 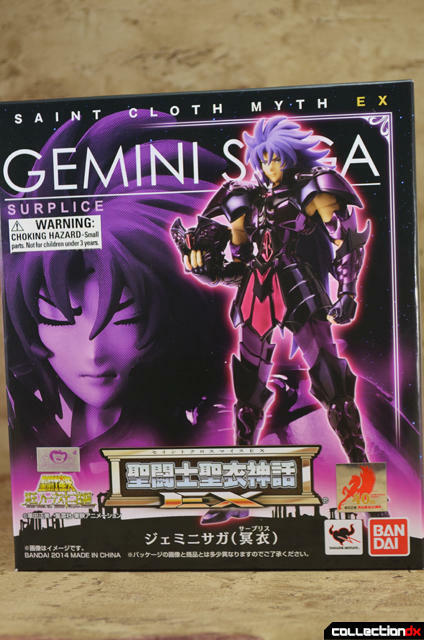 The box for this release marks a bit of a departure from the standard EX Saint Cloth Myth boxes. Until now, the EX SCM boxes were printed to look like a Pandora Box and had product photos on a plastic sleeve that fit over the box. 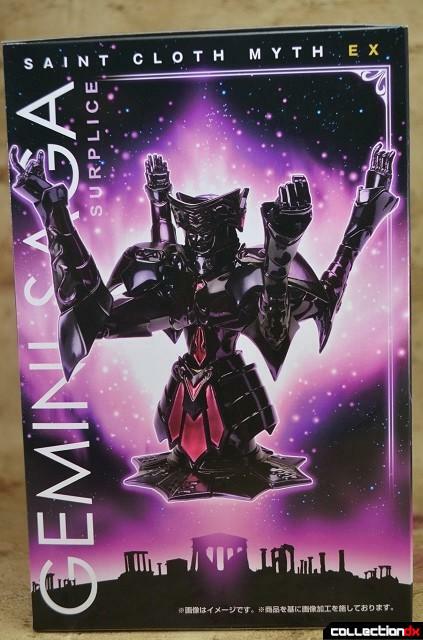 The Gemini Surplice forgoes the Pandora Box design and has the product photos printed directly on the box. So we do not get the option of displaying this along with the other EX boxes in Pandora Box form. 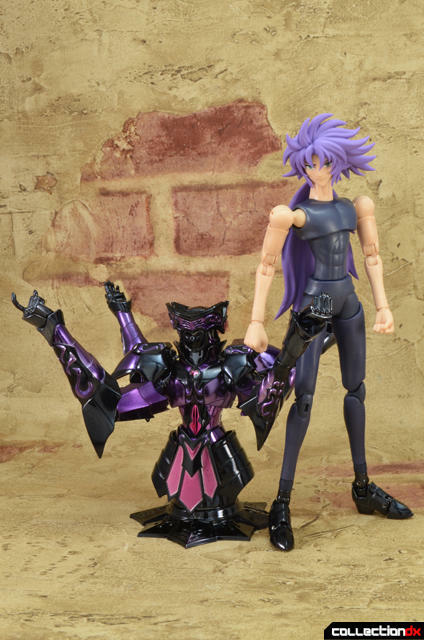 The Object Mode for the Gemini Surplice is very similar to the one for the regular Gemini. It boasts a similar four-armed, double-faced representation of the Gemini constellation. The pointy edges along with the black and purple color scheme makes this Cloth look much more ominous than its golden version. The only issue I had with putting it together is that the instructions only illustrate how to put the armor on two of the four arms. I imagine that the instructions say something about repeating the steps with the other arm that is attached to the on you just did. But that does not help those of us who cannot read Japanese. I had to figure out which of the other arms got which armor by looking at the pictures in the instructions and on the box. When you slap the armor on Saga, he looks pretty darn good. The fit and finish is superb, just like with the EX Gemini Saga. 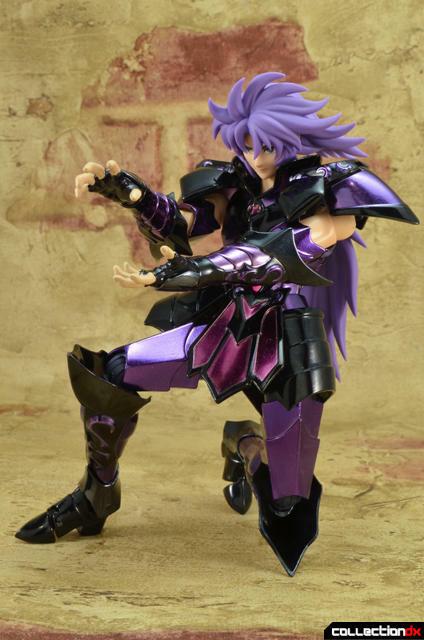 The only minor issue I had with the Surplice was that the armor for the forearms would not stay in place as well as the armor for the EX Gemini Saga. Plastic content is kept to a minimum with this release. 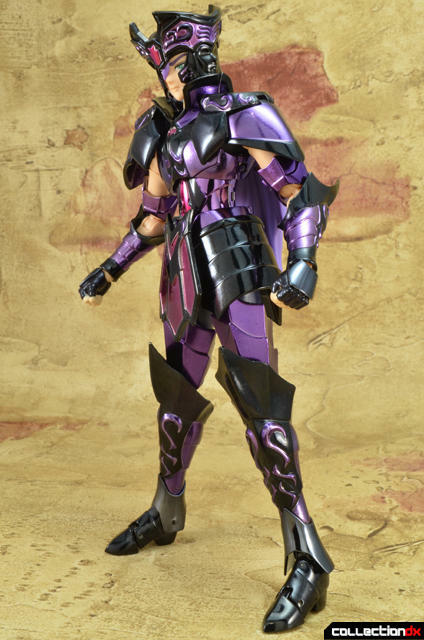 Only the helmet, the covers for the back of the hands, the bottom part of the leg armor, the waist armor and the piece that plugs into the upper back of the figure (not pictured) are made of plastic. I am not a big fan of the bulkiness of the double-faced helmet of the Gemini Cloth, so let’s get rid of that right now. Look at the lovely hair. The hair on this release fits better than the hair on the origina EX Gemini release. 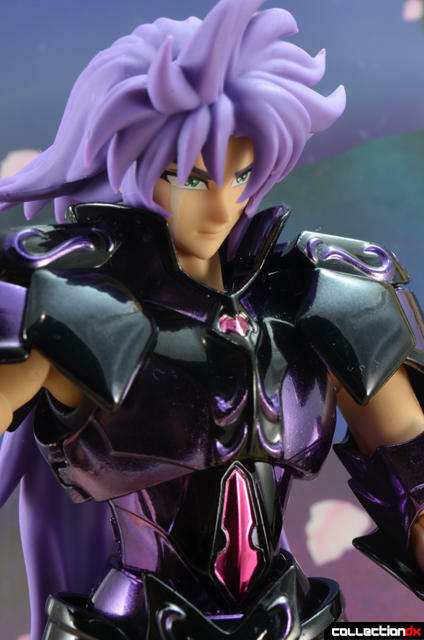 The Surplice Gemini Saga's hair sits flush againt the face and looks more natural. Let's get the two EX release side by side so we can compare the design of the Cloths. 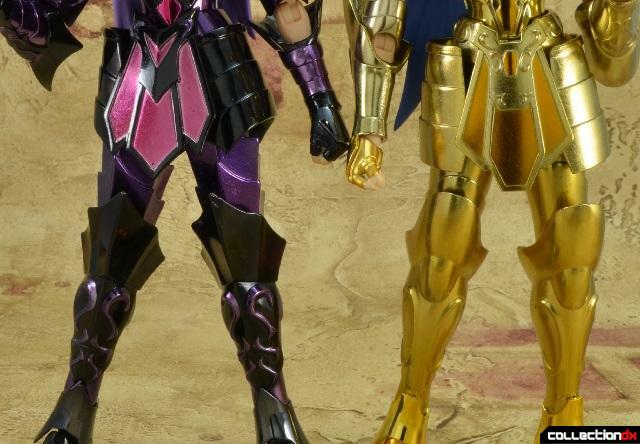 While the basic design of the Surplice is similar to the regular Gemini Cloth, you can see that the Surplice trades in the gold and saintly look of the original for black, purple and pointy. Also, the finer details of the Surplice- the emblems, the trim, the flare of the collar, the arching on the side skirts and the way in which some pieces connect- are different from the regular Gold Cloth. 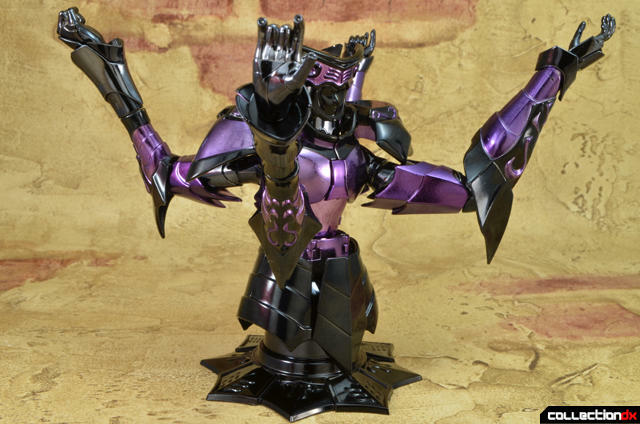 So the armor for this toy is not a repaint of the regular EX Gemini Cloth. I think the only pieces of armor that are reused are the kneepads that are hidden under the leg armor. The faces for this release are also original molds. 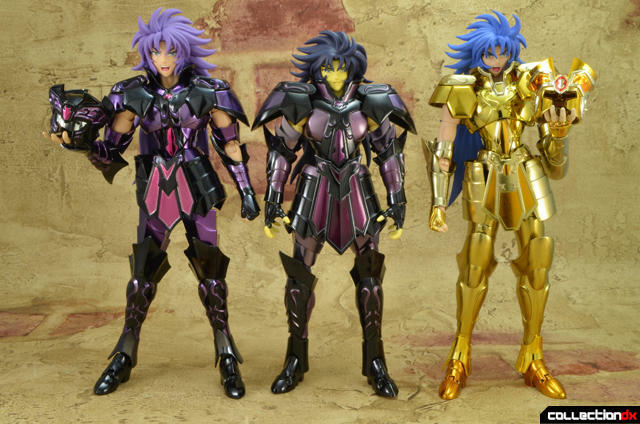 The facial features of the EX Surplice Gemini have been altered a bit from the Gold Saint version, resulting in a better looking face that is less cartoony. 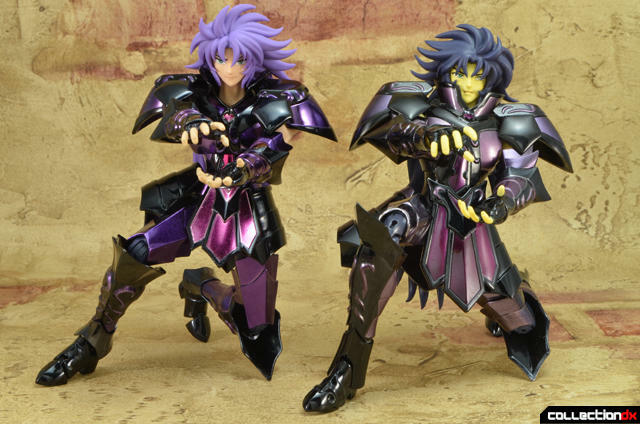 The EX Surplice Gemini’s face is on the left. The face for the regular EX Gemini is on the right. 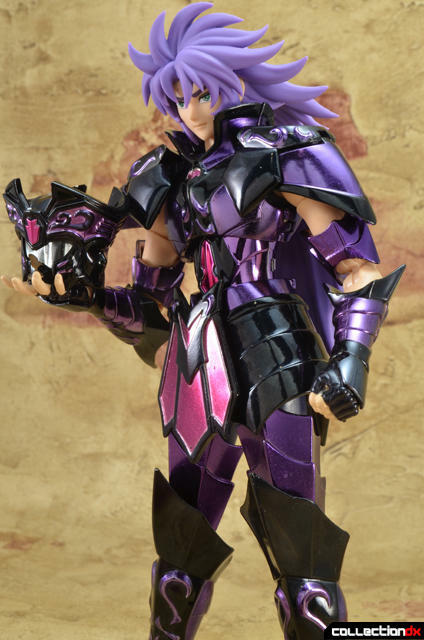 Not only is the EX Surplice version of the Gemini Saint better than its previous EX iteration, it is also a superior to the Gemini Surplice that was release in the regular Saint Cloth Myth line. The original release used a lighter, been-dead-for-a-while off-white for the body Saga. 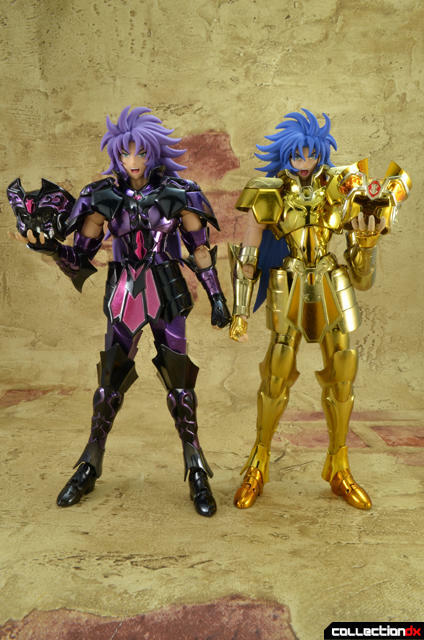 The EX Surplice version is the same color as EX Gold Saint version of Saga. The latter is how Saga looks like in the Hades OVAs. The proportions of the EX release are also much more in line with how the characters looks in the Hades Chapter. The only real issue with the looks of the EX version is that the waist is a bit too thin. But that is true for all of the EX Gold Saints, so it is par for the course at this point. 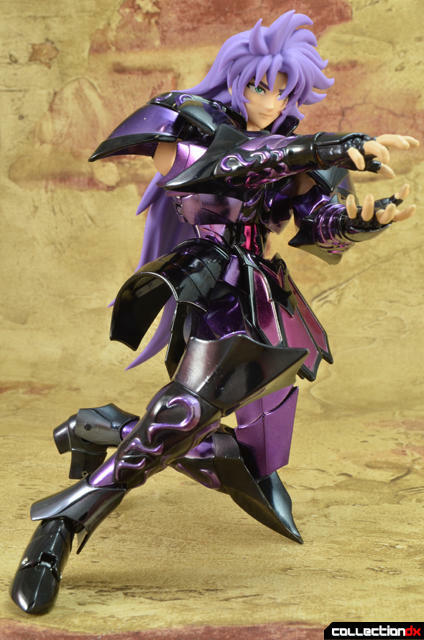 Being an EX release, this figure has the awesome articulation of the Saint Cloth Myth EX body. 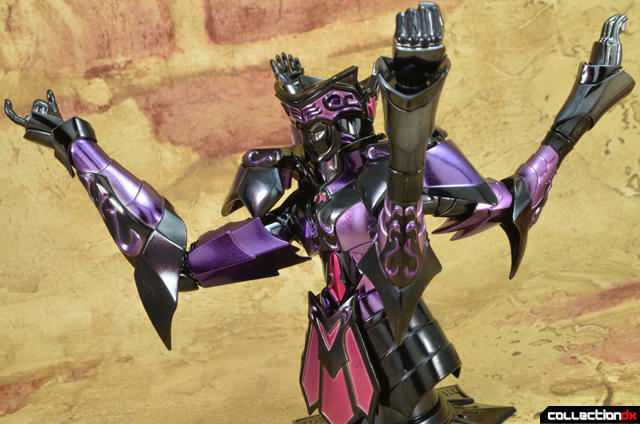 The armor for this release has been designed to allow toy to move very well even with the armor attached. 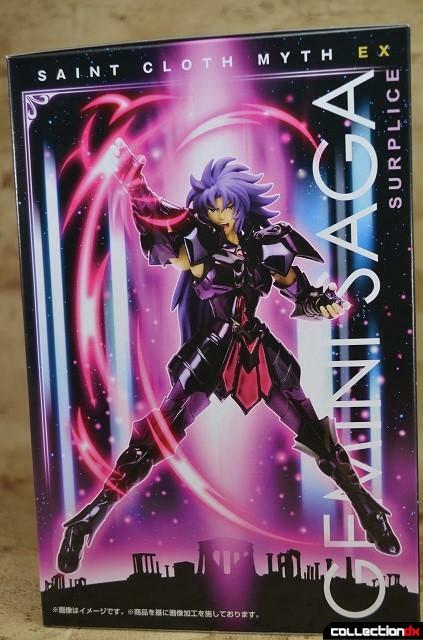 For this version of Gemini Saga, there has been a couple of changes from the original EX Gemini release: Bandai has added a clip to hold the belt on and they gave the toy a smaller plastic cover to fit the samller hole in the upper back's armor. These small improvements do not affect the articulation of the toy when it is fully armored. 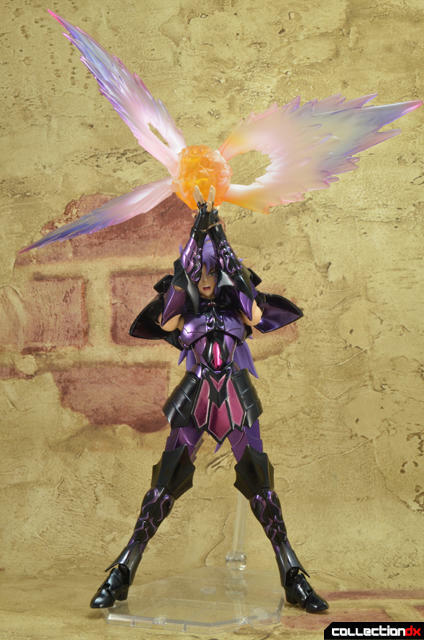 Saga can ready a Galaxian Explosion thanks to the multi-jointed shoulder pads that can move back and spread apart to allow a great amount of movement for the upper arms. However, the shoulder pads for the EX Surplice Gemini are harder to maneuver when attached to the rest of the armor. If you try to rotate them to a position at the rear of the toy, they have a tendency of coming off of the toy. So it is easier to take the shoulder pads off, rotate the joints and then attach the shoulder pads to the toy. Moving onto the lower body. Saga can take a knee. But I won’t show you guys that this time around. Instead, let’s see how he pulls of his part of the Athena Exclamation, the super-attack that is so strong that Saints were banned from using it. 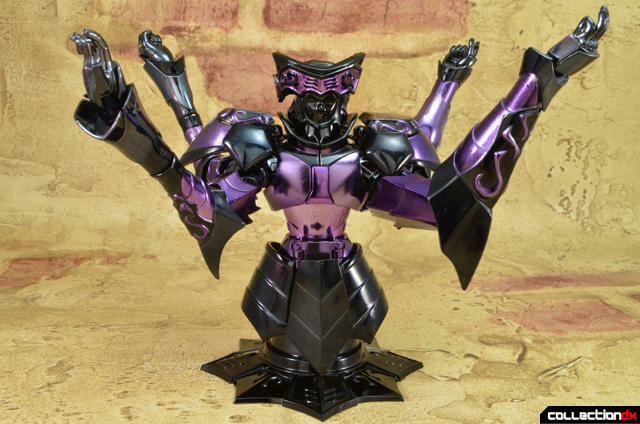 The skirts for this release have very much the same multi-joints that the previous EX Gemini Saga had, which allow the legs to move very freely. 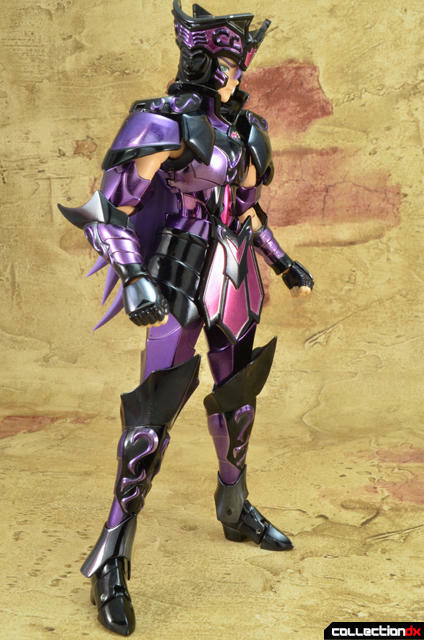 The only thing I don't like about the skirt armor for the EX Gemini Surplice is that the rear skirt will sometimes fall off due to the rod on the skirt coming free from the arm that connects the skirt to the belt. 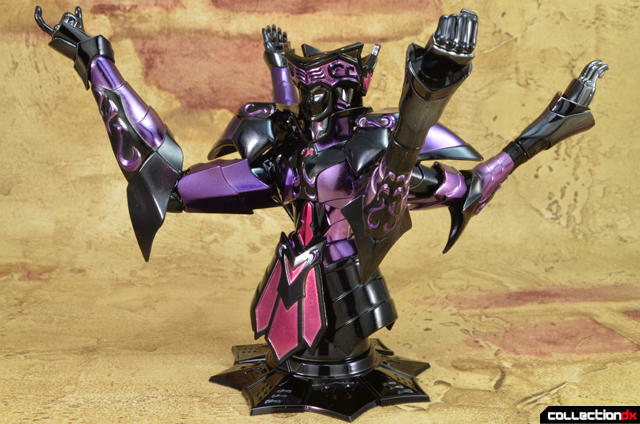 You can see that this release can perform the Athena Exclamation much better than the previous Gemini Surplice toy. You can see how having the waist armor slimmer and separate from the chest armor allows the EX version to be upright in this crouching pose. 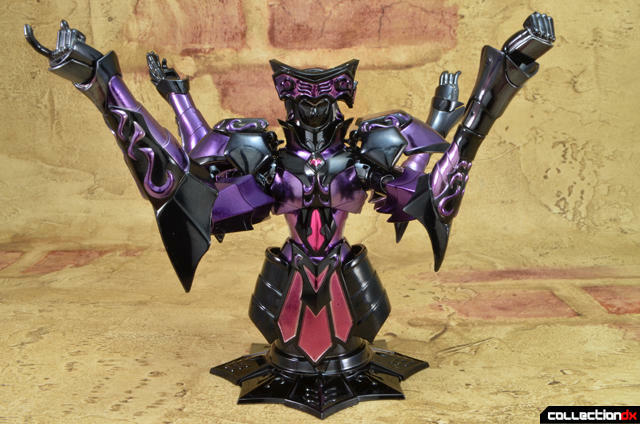 This makes the pose for the EX Gemini look much more natural. This time around, Saga is a little bit light in the extras department. 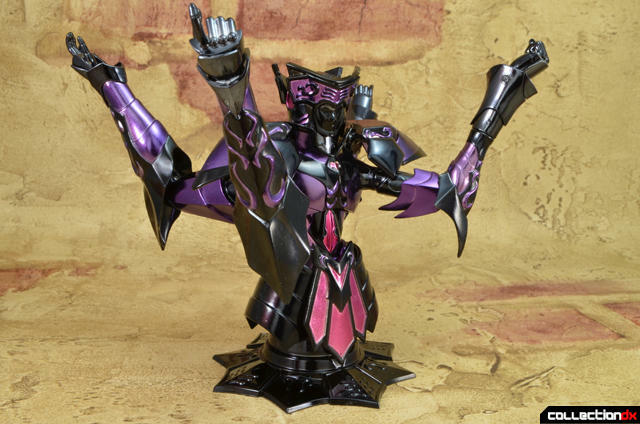 He comes with 11 hands, which come attached to a hand holder piece. Putting the hands into a holder piece is a nifty new trend of the Saint Cloht Myth line. Also included are four faceplates: eyes closed, crying, serious ands screaming. The crying face is to show Saga has an emotional moment or two in the Hades Chapter. The final extra for this set is the inclusion of the dagger that Saga uses when he confronts Athena. Queue Chikyuuji by Yumi Matsuzawa. That is it for this release. We did not get a three-piece plastic cape, which is a staple for the EX Gold Saints. But that is fine since Saga did not use such a cape when he dons the Surplice. Although it is not true to the show, the absence of such an extra makes this release feel a bit lacking when you open up the box and look at the plastic trays within it. 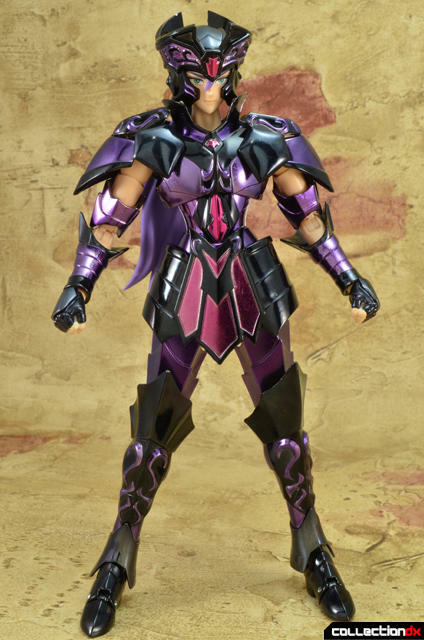 It would have been cool if Bandai had included a dark cloak, so you could dress Saga up to look like he does in part of the Hades Chapter. Turns out I am not the only who thought this would be a good idea. 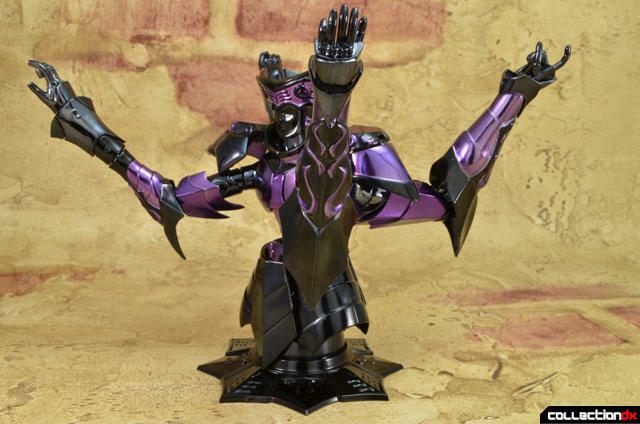 There is a third-party company that is making a nice two-piece cloak so you can display your Surplice Gemini as he is revealing his identity. 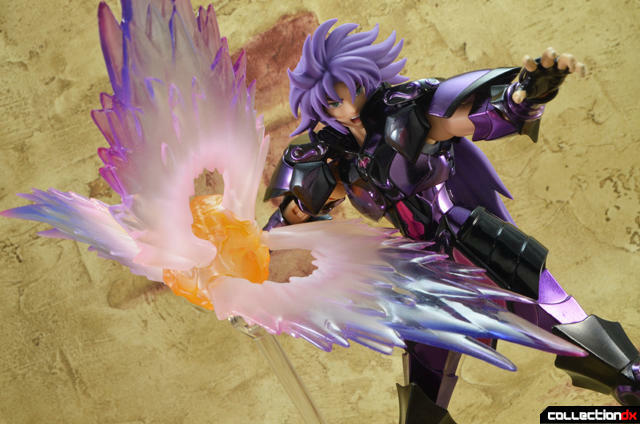 Also, unlike with the regular EX Gemini Saga, we do not get a Galaxian Explosion effect part for this Saint. This is omission in conjunction with reduced extras can make one wonder how this release ended up costing more the regular EX Gemini Saga. Lucky for me, the regular Saga doesn’t mind sharing his effect part with himself. 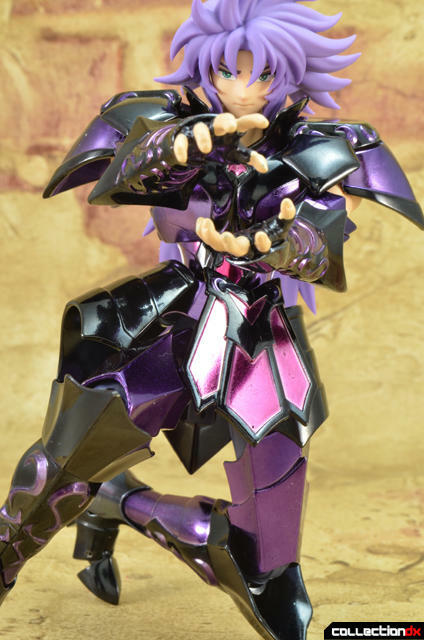 So the EX Gemini Saga Surplice is a solid piece, just like the non-undead version of the character. It is also cool to see that Bandai did not simply reuse as much as they could from the first EX Gemini release. 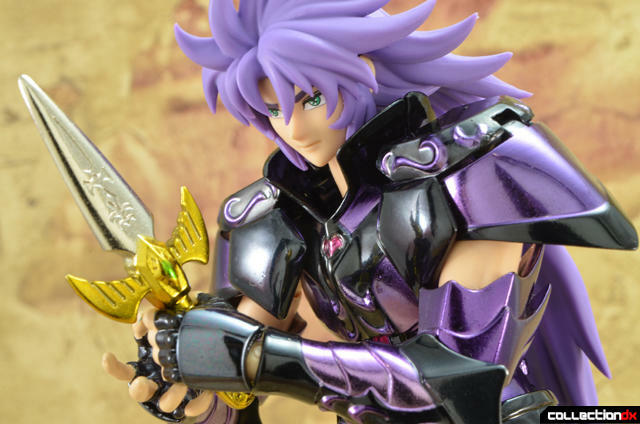 Bandai is improving the EX line and that is evident in the slight improvements they made between the two EX Gemini Saga figures. 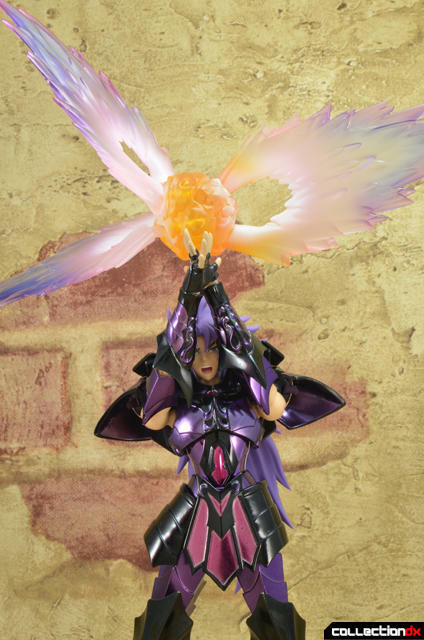 So this toy is a must have for anybody looking to put together the most show-accurate Athena Exclamation display using Saint Cloth Myth figures . However, I can see how the missed opportunities and the increased price of this toy may keep some from buying this release. If only his hair wasn't as brightly colored as King Endymion's suit. It makes it noticeably less accurate to the anime. I really hate Bandai's liberties with Cloth designs. True. The mistakes that Bandai is making with these is leaving plenty of room for the 3rd party companies to release pieces to correct the mistakes that were made. 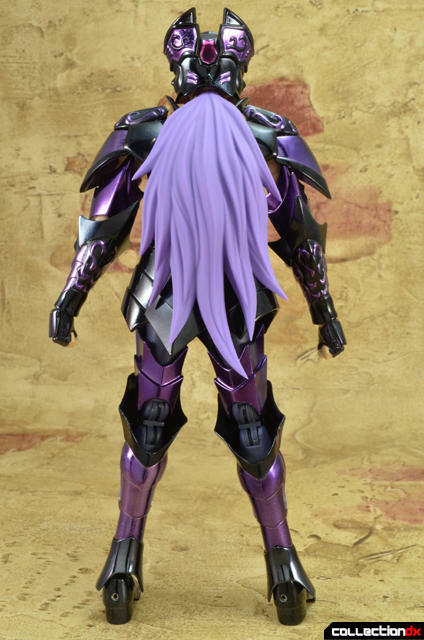 One company made that flowing hair piece for Virgo Shaka, which should have totally been included with the EX Shaka release to begin with.